The mechanisms underlying the development of root necrosis in cassava infected with cassava brown streak viruses are not currently understood. Root necrosis is the symptom responsible for the majority of marketable and edible cassava yield losses. Better understanding will have a major impact upon cassava breeding programs in Rwanda and many other countries in Sub-Saharan Africa. This project seeks to explore whether cassava varieties that do not show root disease symptoms actually contain the virus and are resistant to necrosis, or whether these varieties are able to restrict virus movement to their roots. 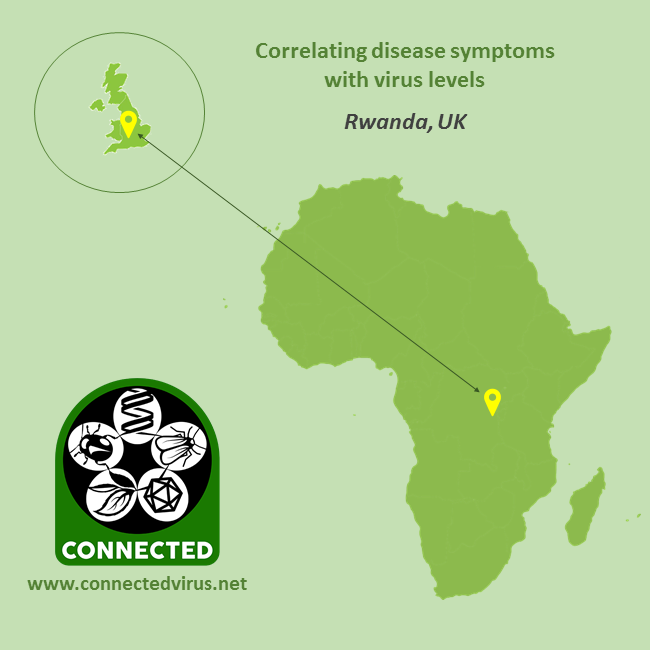 Specifically the project will investigate whether there is a link between virus concentration and root necrosis symptoms in cassava roots affected by Cassava Brown Streak Disease (CBSD) in Rwanda. This will improve understanding of why some CBSD-affected cassava varieties show high virus concentrations in leaves and stems, yet develop fewer necrotic lesions in roots. Network members can find further details about those involved in the project by logging in to this site as a member, and using the Member Directory. To become a network member free of charge, use this link.